July 28, 2013 Nefer Khepri, Ph. D.
If you think you would enjoy a creepy good time at the movie theater, then “The Conjuring” is the movie for you. It’s also turning out to be quite the movie of the summer having grossed $41 million during its first weekend. As of this weekend it is still packing theaters across the country, and with good reason. 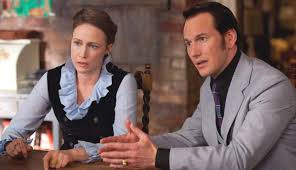 Directed by James Wan, “The Conjuring” stars Patrick Wilson as Ed Warren and Vera Farmiga as Lorraine Warren, who are renown the world over for their outstanding work as paranormal investigators and demonologists. The Warrens are real people and “The Conjuring” is based upon two of their most famous cases: the Annabelle Doll and the Perron House in Harrisville, Rhode Island. Left: Lorraine Warren with the real Annabelle doll. 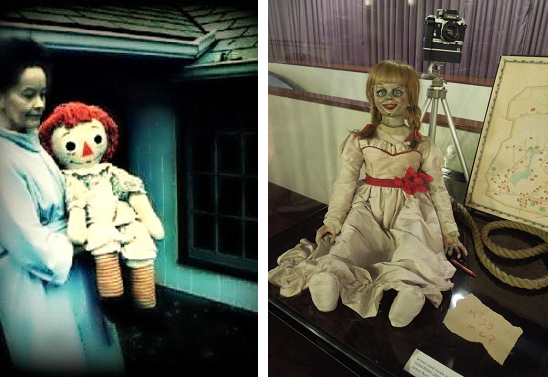 Right: The movie version of the Annabelle doll with movie props. The movie starts with the case of the Annabelle Doll, a doll possessed by a non-human entity, otherwise known as a demon. After the Warrens wrap up that case and are giving a lecture they are approached by Carolyn Perron who claims her family is beset by paranormal disturbances that are growing increasingly worse and she fears for the safety of her five daughters. The Warrens promise to help and thus begins their odyssey of delving into the entity that has a firm grip on the Perron’s home and property. Unlike most horror movies, this one makes that infamous claim, “based on a true story.” The word is this movie is based upon the case files of Ed and Lorraine Warren. Ed Warren passed away in 2006, but Lorraine Warren is 86 and has a cameo in the film (you can spot her seated on the left during the Warrens’ lecture at the college campus). Lorraine Warren insists the movie depicts the truth. Members of the Perron family (one of the daughters wrote a series of self-published books about the family’s experiences during the 10 years they lived there) also insist it is true with just a few embellishments for the moving having been made. All I can say is that based on what I know from my own practice and experiences with clients, the events depicted in this movie are common occurrences in cases of extremely negative spirits and non-human entities, or demons. There was nothing fantastical or extremely out of the “paranormal norm” depicted here, and from a paranormal standpoint the entire movie is completely believable. 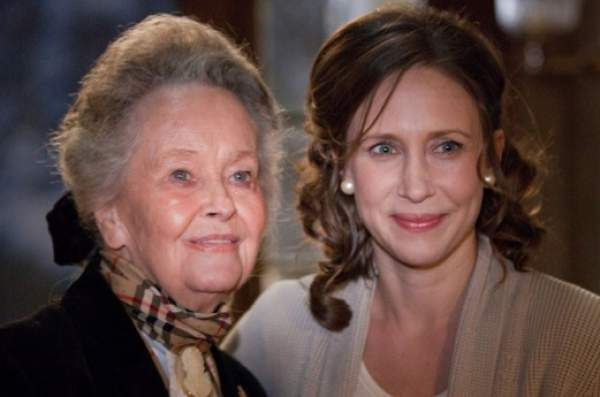 Lorraine Warren & Vera Farmiga. The actors all do an excellent job, the hardest of which goes to Vera Farmiga who portrayed Lorraine Warren. I once saw an interview with Jeremy Irons after he had one the Oscar for playing Klaus Von Bulow in “Reversal of Fortune,” say, that portraying someone who is still living is the most difficult acting job there is. I tip my hat to Ms. Farmiga who had me believing she was Lorraine Warren despite having seen Mrs. Warren in numerous TV appearances over the years, some of the most recent being on the A&E series, “Paranormal State,” for which she has been brought in as a consultant for more severe cases. My only criticism is her acting seemed wooden in places, as though she were merely saying her lines instead of feeling the emotion behind them. The movie is atmospheric without having to go overboard and the audience is clued in early that this house has major problems when the family inadvertently discovers a cellar that has sometime in the past been mysteriously boarded up. Note to self: if I ever move into an old house and find a room or closet boarded up LEAVE IT ALONE! 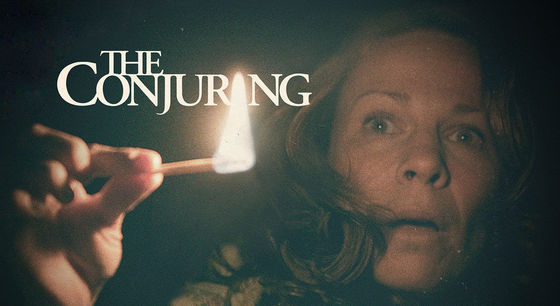 “The Conjuring” develops with the family becoming increasingly victimized by the supernatural forces in their home as the Warrens carry out an investigation and ultimately an exorcism. There are quite a few genuinely frightening moments in the film that had me literally jumping in my seat. “this is the best movie I’ve seen in a very long time, regardless of the genre.” For once, I agree with him. A miracle! 1 star is being withheld due to Ms. Farmiga’s acting at times appearing a bit wooden. That is my only criticism of the movie, and it’s a small one. To read more about the Annabelle doll, visit the Warrens’ website. Previous Predicting the Gender of the Royal Baby with the Egyptian Lenormand. Next Egyptian Lenormand, the Review & the Interview.